Smokers, who want to stop smoking, 60 percent work if switched to electronic cigarettes, than if they use nicotine replacement products or gum, or just simply have a strong determination, researchers said on Tuesday, May 20, 2014. Researchers say, based upon the results of a study of nearly six thousand smokers for five years, it appears that electronic cigarettes play an important role in reducing the number of smokers, so as to reduce the death and disease caused by tobacco. In addition to causing lung cancer and other chronic respiratory diseases, tobacco smoking is also a major cause of coronary heart disease, the number one killer in the world. "The electronic cigarette significantly improve public health because of the widespread appeal and substantial health benefits to smoking cessation," said Robert West, an expert in epidemiology and public health at University College London who led the study. Research funded by the charity of Cancer Research UK and published in the Addiction West journal, has surveyed 5,863 smokers between 2009 to 2014 who try to quit without the use of prescribed drugs or professional help. The research results adjusted for various factors that could affect the success of smoking cessation, says West - including age, dependence on nicotine, previous attempts to quit smoking, and whether such efforts done gradually or immediately. The results showed 20 percent of those who try to quit with the help of electronic cigarettes quit smoking cigarettes conventional states. A total of 10.1 percent of respondents who use other aids such as nicotine replacement gum or successfully stop smoking and those who only rely on willpower as much as 15.4 per cent successful. 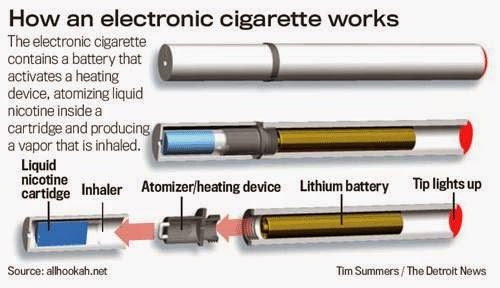 Electronic cigarettes containing nicotine are stimulants harmless-but-addictive issued through water vapor instead of smoke like tobacco is burned. Relatively new product that has become very controversial. There are differences in opinion as to whether the cigarettes will be the best tool to help those who want to quit smoking or just be replacing one bad habit with another bad habit. Since the switch to using electronic cigarettes from tobacco cigarettes do not have to stop dependence on nicotine, some experts say these products can help to stop smoking - which by the World Health Organization (WHO) called "one of the biggest public health threats the world has ever faced". Yet another opinion said the lack of scientific evidence to support the long-term safety and effectiveness of electronic cigarettes, as well as a warning that the product could make a habit of smoking as normal and desirable young children or those who were non-smokers. West agreed that the evidence regarding the long-term use is still lacking, but he stressed that consideration of risk should see strong evidence of loss due to tobacco. "It was not clear whether the use of electronic cigarettes carry health risks, but from what we know about the moisture content, it will be much less compared to smoking," he said. Based on WHO data, resulting in the death of half the tobacco cigarette smokers, with mortality rates reaching six million people per year. West said the evidence shows that smokers who seek help of a doctor or health clinic that provides services to quit smoking has the highest success rate.